Having a small complete medical book to put in your bug out bag or seventy two hour kit has always been a problem for me. It needs to be small, lightweight, simple to understand and packed with good advice. After looking at several good possibilities, I have decided to go with the 3rd Edition of “A Comprehensive Guide to Wilderness and Travel Medicine” published by Adventure Medical Kits. This 190 paged, Pocket-Sized book goes far beyond traditional first aid. Includes vital information on gunshot wounds, arrow injuries and treating complications such as tension pneumothorax, sucking chest wounds, shock, stabilizing an impaled arrow and controlling bleeding. Throughout the book you will find information on improvised techniques developed by Dr Eric A Weiss. His improvised techniques allows you to manage some serious injuries with a minimum amount of medical training and equipment. 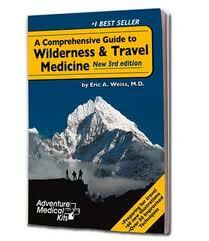 The book is designed to help you when you are in remote locations without ready access to medical help. The book is not a substitute for getting the best medical training available. ABOUT THE AUTHOR–ERIC A. WEISS, M.D., F.A.C.E.P. : is the Associate Director of Trauma and an emergency physician at Stanford University Medical Center in Palo Alto, California. He is an Assistant Professor of Emergency Medicine at the Stanford University School of Medicine. Dr. Weiss is on the Board of Directors of the Wilderness Medical Society (WMS), and serves as a medical consultant to The National Geographic Society, Army Special Forces and The American Red Cross. He is a medical editor for Backpacker Magazine. Dr. Weiss was the Senior Medical Officer at the 1996 Summer Olympics and the expedition physician for The National Geographic Society in the jungles of Belize. As a medical officer for the Himalayan Rescue Association in Nepal, he has provided medical care to thousands of trekkers and climbers at a high altitude clinic near Everest base camp. I am placing this book in all my bug out and get home bags. This entry was posted in books, bugging out, medical, Seventy-two hour kits and tagged 72 hour kit, bug out bag, get home bag, Howard, Medical, medical book. Bookmark the permalink. I’ve been looking for a book that covers more than basic first-aid and this looks like it may be what I’m looking for. Thanks for the tip. Yes, this absolutely is a good book – if I had to take only one medical book with me, it would be this book.